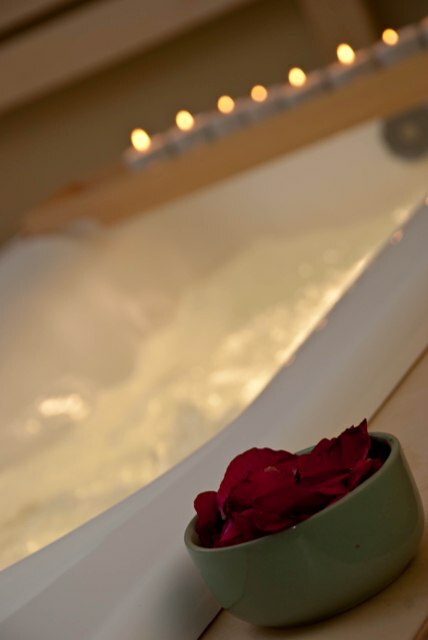 If you would like to rejuvenate and refresh your body we would recommend visiting our Mini Spa. We are offering 4 fantastic types of sauna – steam room, Finnish sauna, infrared sauna and sanarium. In addition to saunas you can enjoy refreshing plunge tub on patio. You have also opportunity to stay in healing Salt Therapy Room, relax in the jacuzzi and enjoy deeply relaxing massage. The steam cleans your skin and heat speeds up the chemical processes in the body and through the skins sweat glands the body rids itself of waste products and toxins. It helps to improve skin structure leaving it firm and elastic. Infrared sauna works with infrared waves or thermal waves entering into the enclosed space. Harmless waves penetrate deep into our body for a deep heating action of your organs, speeding up your metabolism and blood circulation, removing toxins and strengthening the immune system. Recommended session for Infrared Sauna is 20-30 minutes. Before and after your session you should drink plenty of liquids. Sanarium is low temperature sauna for relaxing. It is calming, cleansing and refreshening. It is just great to relax and ease your body in this sauna with pleasant aroma. Finnish sauna is positively invigorating for the body and the soul, cleansing and truly rejuvenating. also known as Swedish massage is most common type of massage and involves different moves and techniques. Upon your wish or need you can request upper body massage or your therapist can pay special attention on problematic areas back, neck, nape of neck, shoulders, hands, feet, etc.). The relaxing whole-body massage helps to fight fatigue, improves the immune system, balances the nervous system and promotes breathing. Body warmth and vitality increase whereas the heart and blood circulatory system are opened to receive the fresh oxygen. You may feel yourself a bit languorous right after the massage but soon a good and relaxed feeling due to the released energy and improved circulation embraces you. Head massage relaxes, improves blood circulation, stimulates the lymphatic system and hair roots growth, relieves tension in the eyes and improves concentration. Your body is instantly reducing stress hormones during the massage and helps to relieve tension and feel pleasured within both your mind and body. Head massage will leave you fully relaxed by also relaxing smooth muscles inside your body. Head massage is suitable for everybody. On the basis of pure goats´ milk, whey and coconut milk. The milk bath balances, soothes and revitalises the skin. Milk proteins are particularly good for sensitive or dry skin. Upon your wish we can add some dried rose petals or cornflower petals. Soya oil and peanut oil mixture is added to your bath, which includes plenty of vitamin E and C as well as citric acid. Silk Bath hydrates and softens your skin, leaving it luxuriously silky and smooth. The bath provides all the beneficial properties of sea water. Salty sea water contains; iodine, calcium, magnesium, sulfur and various minerals. By taking sea salt baths, we supply the organism with useful substances witch speed up metabolism, strengthen immune system , improve blood circulation, refresh and firm your skin. Nice and effective marine body peeling is preparing your skin for different bath procedures. The peeler includes seaweed extract, carnauba wax and oyster extract. It will leave your skin silky soft and moisturised. It is a perfect treatment before and during the sunbathing season so that it will leave you a beautiful complexion and juvenile skin.